: The Norwich and Norfolk Terrier take their names, obviously, from the county and the city, though turning the clock back to the early and mid-1800s there was no such dis­tinction, this being just a general farm dog. 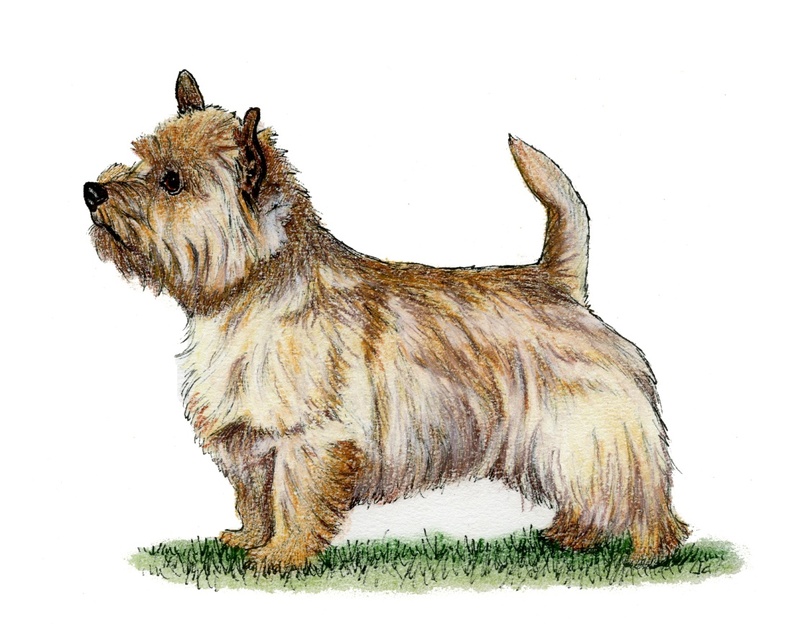 Glen of Imaals, red Cairn Terriers and Dandie Dinmonts are among the breeds behind these East Anglian terriers and from the resultant red progeny emerged the pre­sent Norwich and Norfolk Terrier. A typical short-legged terrier with a sound, compact body which has been used not only on fox and badger, but on rats as well. He has a delightful dis­position, is totally fearless but is not one to start a fight. As a worker he does not give up in the face of a fierce adversary underground, and his standard’s reference to the acceptability of ‘honourable scars from fair wear and tear’ is a good indication of the type of dog. : One of the smallest of the terriers. Low, keen dog, compact and strong with good substance and bone. Honourable scars from fair wear and tear not to be unduly penalised. : Lovable disposition, not quarrelsome, tremendously active with hardy constitution. Gay and fearless. : Slightly rounded, wide, good width between ears. : Wedge-shaped and strong. Length about one third less than measurement from occiput to bottom of stop. : Jaws clean and strong. Rather large, strong teeth with perfect, regular scissor bite, i. e. upper teeth closely overlapping the lower teeth and set square to the jaws. : Ribcage long and well sprung. With good depth. : Legs short, powerful and straight. : Broad, strong and muscular. : Hocks low-set, with great propulsion.